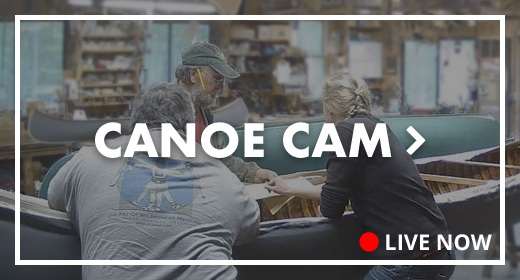 Books & Videos - Northwoods Canoe Co. The best and most complete guide to the construction, restoration and maintenance of wood and canvas canoes. Abundant photos and line drawings illustrate the step-by-step instructions. Includes study plans for the 17.5′ Atkinson Traveler, the 15′ Cheemaun and the 10′ Whisper. The book is also a careful history of the evolution of the wood and canvas canoe, including extensive discussion of the building of birch bark canoes and sketches of many of the early canoe builders: Gerrish, White, Morris, Old Town and others. The birch bark canoes of the North American Indians were among the most advanced watercraft of their age. They could be used to carry heavy loads in shallow streams, but were light enough to be hauled long distances over land. Built with Stone Age tools, their design, size and appearance varied to suit the requirements of their users. Upon arrival in North America, European settlers began using the native-made craft for traveling through the wilderness. Many of today’s canoes are based on these age-old designs. Illustrated with black and white drawings, diagrams and photos, this fascinating guide explores the development of the canoes, their role in history, the materials and tools used to make them, their form and fabrication, regional differences in design and construction, and more. Anyone interested in canoes or the skills of the Native Americans will find this book as illuminating as it is important. The Conovers are writers, educators and guides who have escorted thousands of wilderness adventurers through the wilds of the north. Now, you can take their expertise with you wherever you go. This is a guide to traditional winter camping. Learn how to stay warm in extreme cold temperatures and environments. Get practical advice on setting up tents and choosing the right gear. Discover and learn tips on reading lake and river ice conditions. Learn how to sleep warm, travel safe, and many other skills that have become a lost art form. It’s all in this essential book. Reprints of these historic canoe catalogs offer a glimpse into the vast array of canoe styles being offered at the turn of the century. The pictures and descriptions of the canoes and their hardware make these catalogs wonderful guides for restoring old canoes built by these companies. 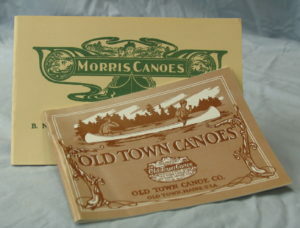 Reprinted by the Wooden Canoe Heritage Association, LTD. In my years of boat building and teaching, I have found that many people are intimidated by the need to steambend wood, even though steambending can easily be done in a home shop without elaborate equipment. The first portion of the video deals with theories of wood bending: how the compression and stretching of the wood during bending stresses the piece. Understanding this theory allows you to anticipate problems and prepare to address them. Then, I take up practical issues of how to select wood – for species, dryness, grain, knots and flaws, shape – and how to prepare and pre-shape the wood. Next, I show you how to construct a couple of different models of home-built steam boxes, made from simple materials, and I discuss alternative steaming operations. In the second half of the video, I bend several different pieces for you to see, from simple to more complex operations, and show you some tricks for handling difficult bends. Although I show steambending mainly for canoe construction – ribs (both for new canoes and replacement ribs for damaged canoes), hardwood stems, pre-shaped rails and decks – the same theories and techniques apply equally to wood bending for all kinds of purposes. Whether you are working on larger boats, fine furniture, snowshoes, toboggans or any other bentwood projects, this video will help you make successful bends. I made this video to help people understand the principles and techniques of building wood/canvas canoes. Using a 17-foot wilderness guide canoe as a model, it guides you through every step of construction, from selecting the rough stock and shaping the ribs, through steambending, planking, canvassing, and sanding, to painting and installing the brass stembands. Whether you want help building your own canoe or just want to know more about traditional canoe construction, you will find this film informative and, I hope, entertaining. This video is an excellent companion to the book, The Wood and Canvas Canoe, and helps explain some of the more esoteric aspects of canoe building that are difficult to put in writing.